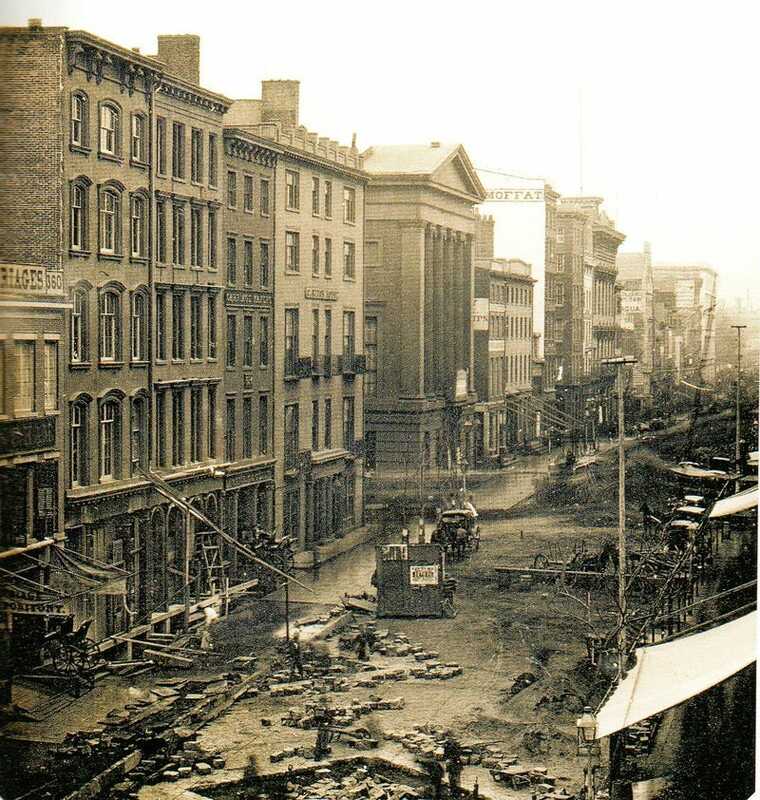 Twitter lit up with wows Thursday morning as this handsome photograph of Broadway and Franklin Street in Manhattan circa 1850 got passed around. According to one source, it’s “believed to be the earliest photograph taken of New York City.” That would be cool—if it were true. It’s not. Sure it looks old—there’s a horse and buggy! it’s sepia-toned!—but it’s tough to say if this is even a pre-Civil War photo. Are those power lines to the right? Where is Daniel Day Lewis’s character from Gangs of New York? And what the hell are they doing to the street? The actual oldest known photo of New York City contains very little city. A daguerrotype believed to have been taken in 1848 sold for $62,500 a few years ago. It shows a surprisingly bucolic scene—you’d never guess that the road in the foreground is actually Broadway. Actually, at the time it was “a continuation of Broadway,” according to a note that was included with the daguerrotype. This means that the road in the photo is likely Bloomingdale Road which became Broadway in 1899. Of course, it’s possible that there’s an even older daguerrotype kicking around in somebody’s attic somewhere. But it’s not that likely. The daguerrotype made its way from France to New York City in 1839 when Louis Daguerre perfected the technology. Although we know that daguerrotypes of things like City Hall Park were taken and publicly displayed, none have survived. Before the above photo was discovered at a small auction in New England, the oldest known photo of New York City was a daguerrotype of Chatham Street in downtown Manhattan, taken between 1848 and 1853. Figuring out the exact date is complicated for a number of reasons. It’s a pretty fascinating vista, though. Who knew there were so many awnings in the mid-19th century? When you’re dealing with this period in history, however, photographs—including daguerrotypes—are just plain rare. Consider, for instance, that the oldest known photograph in the world dates back to 1826. (It’s not very good.) Louis Daguerre himself took the oldest photograph of a living person in Paris in 1838. You can see the person in the lower lefthand corner getting his shoes shined. When you consider the fact that Daguerre’s photo required a ten-minute exposure, you can understand why the world wasn’t full of shutterbugs. But at least New York had a couple.